It is a well-established fact that some wardrobe classics never date. Here is a timeless piece which is simple, stylish and easy to wear. This iconic undergarment never gets old: Suspenders! 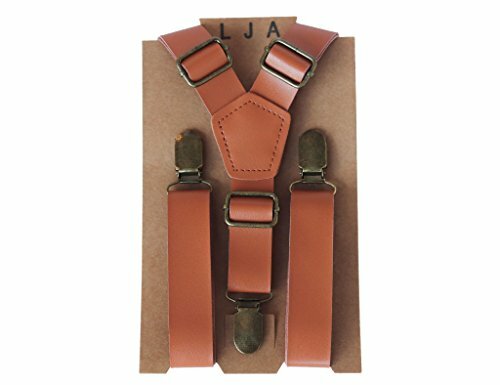 London Jae Apparel Suspenders featured in faux leather in Vintage Tan and Caramel colors. The trendy Y-back suspenders are made with high quality faux leather for more comfortable wear. They are easy to adjust and comfortable to use. With two metal length adjusters, so you can easily adjust to conform your body. London Jae Apparel Suspender, for classy timeless look. 1" width Great for groomsmen suspenders, special occasion, prom, rustic wedding, beach wedding, family photos, theater performances and celebrations. If you have any questions about this product by London Jae Apparel, contact us by completing and submitting the form below. If you are looking for a specif part number, please include it with your message.